By clicking on the numbers below you will be taken to an individual page for each attraction. You can also view a list of all attractions or biking if you wish. 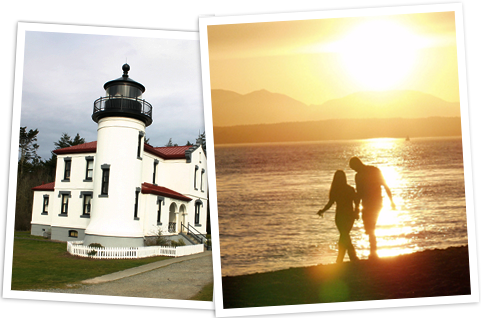 Many, many more attractions can be found on Whidbey Island just ask your Inn Keeper, they will be happy to supply more information and maps. Washington’s favorite state park. Visitors flock to see the spectacular bridge and Pass. Because of Whidbey Island’s temperate climate, many birds and waterfowl winter here, including an abudance of bald eagles. Fishing is popular in Cranberry Lake and in waters surrounding the Island. Charters are available at Cornet Bay’s marina. Sightseeing, dinner, and whale-watching cruises are available from many nearby sites. Camping and RV parking are available year round. Stunning views of the Strait of Juan de Fuca, the San Juan Islands, and Vancouver Island. A place to stroll the beach, enjoy the scenery, and watch winter and spring bird migrations. The park and West Beach Road immediately to the south are great locations for watching winter storms and their aftermath–Puget Sound’s only true surf! Picnic facilities near the beach. Day use only. Part of the original “Triangle of Death,” Ft. Ebey protected Puget Sound from invasion. It now offers miles of hiking trails and stunning high-bluff views of Port Townsend and the Olympic Peninsula. Great picnic site. The nations first such reserve, an area mostly privately owned but dedicated to the preservation and enhancement of historic lands and buildings. Trails, beach, and magnificent views of farms, Admiralty Inlet, and the Olympic and Cascade Mountains. Tune in 1610 on your Am radio for more information. The county seat and the second oldest town in the entire state, with more than 100 buildings listed in the National Historic Register. The town’s shopping areas and waterfront reflect the charm of bygone days. Historic inns, friendly pubs, fine restaurants, and intimate B&B’s beckon visitors to stay and relax. Island County’s newest trail will connect Coupeville and Ft. Ebey to unusual Ice Age geologic formations known as “kettles.” Wonderful for biking, horseback riding, or just a scenic stroll. Originally the major focus of the “Triangle of Death” designed to prevent a naval invasion, Fort Casey now welcomes visitors to its battlements and the charming Admiralty Head Lighthouse. The fort’s 10-inch “disappearing” guns are now aimed across the busy shipping lanes filled with freighters, and passenger ships, as well as naval cruisers, aircraft carriers,and submarines. Don’t miss beautiful Crockett Lake and Keystone Spit, adjacent to Fort Casey. Both abound with birds and marine life. Unforgettable vistas of water and mountain await. Take the ferry to Port Townsend from here or check out the activities at the Casey Conference Center. Keystone Sate Park is a favorite of fishermen and scuba divers. A World WarII bombing practice site is now a saltwater estuary with protected birds and animal species. The reserve is also the foreground for stunning sunsets behind the Olympic Mountains. The overlook is east of the highway. At the “waistline” of Whidbey Island, the home of historic Greenbank Country Store, Greenbank Loganberry Farm and Whidbey’s Liqeuer. 53 acres and miles of trails provide color and serenity year round for nature and garden lovers. Old-growth forest, campsites, picnic sites, hiking trails, and sandy beaches. Miles of broad, sandy beach, tidal pools, and unusual bluff erosion. Also evidence of violent glacial action. A small-town world just minutes from the Mukilteo ferry and the fast pace of the metropolis.Tucked into flower-filled alleys and courtyards and along the main street of this waterfront town are art galleries, antique stores, shops, nice restaurants, bakeries, coffee houses, and brew pubs. Langley offers views of Saratoga Passage, Camano Island and the Cascades. On most days are seen bald eagles, great blue herons, sea lions and maybe even a migrating gray whale. The W.I.C.A. 246-seat theater supports a year-round program of local and touring music, theater, and dance. The Langley area also has many small inns and B&B’s. South Whidbey Air Park accomodates small aircraft, and the Langley Small Boat Harbor provides transient moorage. The Mukilteo-Clinton ferry provides the quickest surface access to Whidbey Island from the Seattle metropolitan area and the Sea-Tac airport. Driving time (including ferry) to Clinton from Sea-Tac is about an hour and a half. Clinton has a nine-hole golf course (Island Greens), and fishing is available at Deer Lake, Possession Point County Park (which also has a boat launch ramp and beach access),and the Clinton Fishing River. The island offers a unique mix of long, flat stretches and hilly, windy roads. Pick your routes carefully: 525 has high traffic volume & high speeds. Loops below are safer and scenic. Start in Coupeville. From Main Street, follow highway 20 fora half-mile toward Oak Harbor. Turn left on Sherman Road, then start the loop. Start at the Clinton Ferry Dock. Ride straight up the hill–it’s a killer. towards the end of town, look for the turnoff to Bob Galbreath Road to your right. Start the loop there.